Whether you are in support or are against, a decision in the HECO/NextEra merger application will elicit strong opinions on the outcome. No other recent regulatory decision will have as much impact on the daily lives of most of Hawaii's residents and businesses as this decision. No other regulatory decision will affect the pace, scale and cost of Hawaii's clean energy transformation on electricity customers as this decision. And, probably, rivaling the State's transportation systems (harbors, airports, highways and with the rail system included), no other sector will have as much new public and private sector infrastructure investments that are related to this decision. 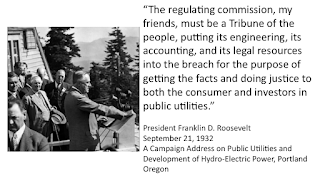 To help understand how the PUC should interact and deliberate, the concept of prudence, described in an Energy Law Journal article entitled "The Prudent Regulator: Politics, Independence, Ethics, and the Public Interest," by Dr. Janice Beecher, Director of the Institute of Public Utilities at Michigan State University, gives insight and valuable food for thought. I bolded certain passages for emphasis. Prudence is a principle central to the theory and practice of public utility regulation, a hallowed standard of review by which utility behaviors and decisions are judged. The concept of prudence might well be applied to the institution of regulation itself and those responsible for its endurance. By nature and necessity, regulation is a political process, but by design it works best with a substantial degree of independence and when regulators are deeply committed to the ethical performance of their charge. The prudent regulator considers their own behavior not in narrow terms of technical compliance with codes of conduct, but in broader terms of institutional stability. The price of imprudence is paid not only by those whose impropriety betrays the public's trust but by the very institutions they are entrusted to service. Adopting an institutional perspective, this review idealizes the prudent regulator by examining the intricately related and largely inseparable constructs of politics, independence, and ethics, and the transcendent imperative of regulation in the public interest. The prudent regulator knowingly and authentically embodies all of these virtues - dedication to public service, obligation to the public interest, intellectual curiosity, personal humility, political independence, judicial demeanor, and commitment to ethics - as well as an understanding and appreciation of why they matter fundamentally to the institution. Good and prudent regulators are a necessary condition for good regulation - regulation in the public interest that is reasoned equitable, and efficacious. The good regulator embraces the public interest, appreciates the daunting obligation to it, and accepts the often agonizing process of discovery. Easier to sense than to define or instill, the public interest is divined not through opinion polls or political expediency but by deliberative weighing of subordinate interests in the context of a social compact to pursue a larger common good. The calculus of the public interest in many respects is a process of elimination, informed by politics but guided by established principles, educated instincts and the artful blending of science and conscience. The intellectually curious [regulator] appreciate complex and multi-disciplinary problems and solutions, apply critical thinking skills, exhibit healthy skepticism, appreciate empirical analysis and welcome constructive debate. Regulators are more than likely to find themselves outside of their intellectual comfort zone. The public-interest mandate, along with the mental rigor of the work, also argue for self-awareness and bringing a healthy dose of personal humility to the task of regulating, which at times may seem antithetical to the political ego and immodesty required of those who seek high office. Hubris, obstinacy, and stridency are clearly contraindicated. Good regulators are generally non-ideological, non-dogmatic, and without agenda or parochial motive. Given the political context and import of their position, the regulator cannot be apolitical, but whether elected or appointment, their service in office should be impartial, unbiased, and nonpartisan not just with respect to political parties, but all parties of interest. Commissioners dispense a specialized form of justice and are well served by adopting a judicial demeanor, temperament, and disposition. The judgelike commissioner is circumspect but decisive and incapricious in the discharge of their duties. Also working to their advantage in the commission cultural model are maturity, sensibility, patience and collegiality. Last and certainly not least, good regulators demonstrate a conscientious and uncompromising commitment to ethics. Policy ends cannot justify political means of subverting independent regulation. On matters of policy, executives and lawmakers must find constructive methods of authoritative expression other than the politically motivated and potentially capricious dismissal of lawfully appointed regulators engaged in lawful regulatory functions. . . Commissioners operating in good faith to serve the public and public interest, however, should be secure in their appointments, unencumbered by political meddling and its chilling effects, and free to respectfully dissent from the policy preferences of those in power. Like all politics, regulatory politics become pernicious when slighter political interests, including the self-interest of politicians, overwhelm the public interest and undermine the public trust. Excessive politicization and undue influence weakens regulation as an institution and instrument of public policy. Regulation that is "too weak" when intervention is reasoned and necessary, is as bad or worse for markets and commerce as regulation that is "too strong" because weakness leads to political backlash, and paradoxically, to draconian political solutions directed toward regulators or the industries they regulate. The downward spiral of vital policy institutions can be fueled by the loss of the independence and catalyzed by ethical breaches. The charge of the prudent regulator is to transcend parochial politics and to guard with tenacity their independence, and thereby the institution they serve. How commissioners perceived their role and that of staff may be at odds with how staff perceives its role and that of the commissioners. Ideally, both will welcome a thoughtful counterpart in their pursuits and neither will settle for captive loyalty. Commissioners should expect more from staff than validation of autocratic declarations; staff should expect commissioners to come to their own conclusions deliberately and not just "rubber stamp" the recommendations made to them, including settlements negotiated by staff with other parties. Commissioners should value and utilize the experience, expertise and impartial analysis of the staff, and appreciate the sensitivities that arise when staff advice is not taken. Staff should always respect the commission's authority and avoid entrenchment, recalcitrance, or the appearance of subversion. Elected or appointed, the independent regulator is neither apolitical nor politically indifferent to the public. Regulators must be sensitive and responsive to their various constituents, perhaps especially the ratepayer-voter. Evershifting public values and preferences are expressed through political processes and factored into the high calculus of the public interest. Regulatory policies that disregard or defy the general will are antithetical to the public-interest doctrine. 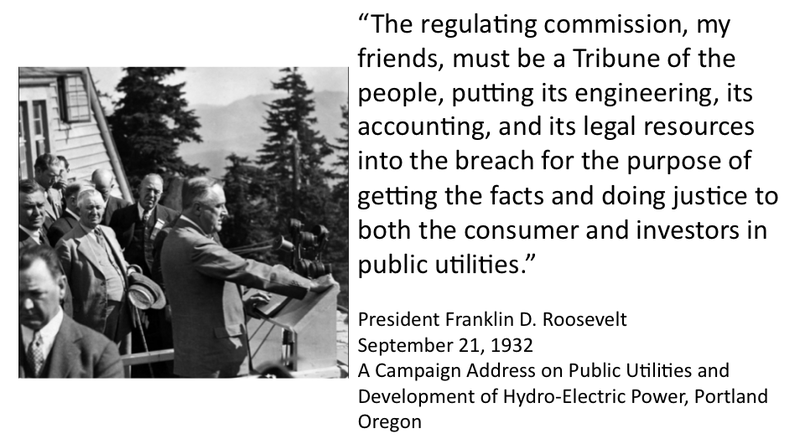 Regulatory commissions, according to [President Franklin D.] Roosevelt, must be a "Tribune of the people. . . getting the facts and doing justice to both the consumers and investors in public utilities." In this important decision and for the sake of the PUC as an important institution, it is time to put away parochial politics, petty differences, special and self-interest advocacy and to work to truly become the tribunal "tribune of the people and to do justice" for both the consumer and public utility.